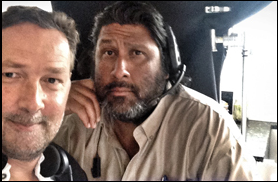 Caught up with Rafael Sanchez in New Orleans, where he is working on Jurassic World with cinematographer John Schwartzman, ASC. That credit will be added to the list of more than 40 feature films on which Rafi has served as gaffer, including more than 20 films with Phedon Papamichael, ASC. A few of the other credits: four Pirates of the Caribbean films, The Lone Ranger, and Tim Burton’s Alice in Wonderland. Jurassic World is Rafi’s first assignment with Schwartzman. I asked him how he adapts his tools and techniques to a new DP “We’ve know each other for many years, but we’ve never worked together until now,” he says. “We’ve admired each other’s work, so there was a level of respect. That made the friendship and the rapport aspect of it easy. It was a matter of me coming in and finding my place with the dynamic of his existing team, which has been in place forever, They made it incredibly easy for me. Prior to the New Orleans segment of the job, the crew worked in Hawaii for a couple of months on big practical locations and jungle scenes. Rafi made extensive use of ARRIMAX, M90 and M40 units to penetrate the foliage with long throws. Gunner Lighting LEDs, powered by Litegear, were employed for closer work.